Wholesale Fleece Picnic Blankets, Outdoor Blankets, Waterproof Blankets, Custom Embroidered Picnic Blankets, Emergency Blankets. PRODUCTS BELOW ARE BULK BOXES CONTAINING 24 BLANKETS. TO ORDER SINGLE ITEMS, SEE OUR RETAIL FLEECE PRODUCTS. Enjoy the great outdoors with a PeachFur Fleece Picnic Blanket. Our blankets are hand crafted with extra TLC using only the highest quality premium fabrics. We use 13oz single-sided 50 x 60 non-piling 100% polyester fleece and waterproof nylon that keeps moisture and dirt out while providing a comfortable and luxuriously soft surface on top. 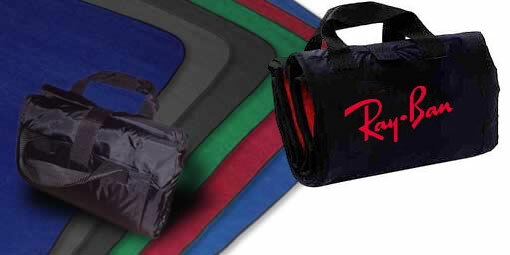 PeachFur Fleece Picnic Blankets are the perfect choice for your next outdoor event. We can embroider your company or special event logo on the side pocket just like the photo shown. Whether its a picnic, sporting event, team souvenir, sleepover, camping trip, emergency preparedness, or promoting your business, our double web carry straps make it the ideal companion wherever you go. For quantities over 1000 please give us a call for a quote. For more information, questions on embroidery and pricing call us Toll Free 1-800-516-0045.